Mythos greenhouse series merge practical design, high insulation, aesthetics and performance. The twin-wall Polycarbonate panels perfectly retain heat, diffuse light to protect from strong sunlight exposure and enhance the durability of the reinforced aluminum structure; these nurturing conditions are ideal for cold areas. 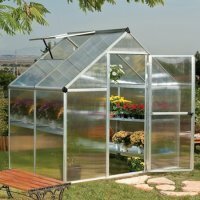 Mythos greenhouses are easy to install with a sliding panel assembly system and include a galvanized steel base, a hinged door, as well as other features that enhance their usability. The greenhouses are capable of withstanding extreme weather conditions for many years of gardening use. Mythos greenhouse series merge practical design, high insulation, aesthetics and performance. The tw..